But there are many reasons, and it is good to ponder, to meditate upon them. A white cloud exists without any roots. It is an unrooted phenomenon, grounded nowhere or grounded in the nowhere. But still it exists. The whole of existence is like a white cloud: without any roots, without any causality, without any ultimate cause, it exists. It exists as a mystery. In Tibet they have a meditation: monks sitting on the hills, lonely, absolutely in aloneness, just meditating on white clouds drifting in the sky, continuously contemplating, and by and by being merged. Then they become white clouds – just perching on a hill like a white cloud. No mind, just being there. No resistance, no fight, nothing to be achieved, nothing to be lost, just enjoying the very existence, celebrating the moment – the joy, the ecstasy of it. 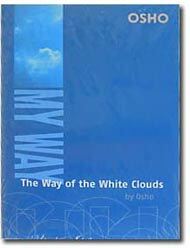 Tibetan mystics, or Zen masters or Sufi dervishes, they have all talked about the white clouds. The white clouds have been catching many people’s inner being. A rapport is achieved; it seems, with the white clouds. Make it a meditation and then many things will come to you. A white cloud is the most mysterious thing, suddenly appearing, suddenly disappearing. Have you ever thought at any time that clouds have no nam-roop – no name, no form? Even for a single moment the form is not the same. It is changing, it is becoming, it is a river like flow. You say to someone: I love you – and that very moment hate is there. You say you are a friend to someone and that very moment the enemy is laughing inside you, waiting for its moment. Some moment you say you are happy and that very moment happiness is lost and you have become unhappy. You have no identity. If you realize this you become a cloud with no form, with no name. And then drifting starts. Meditation means: dissolve yourself before that mystery, annihilate yourself before that mystery, disperse yourself before that mystery. Be no more, and let the mystery be so total that you are absorbed in it. And suddenly a new door opens, a new perception is achieved. Suddenly the mundane world of division, of separation has disappeared, and a different, totally different world of oneness comes before you. Everything loses its boundary; everything is with others, is not divided but one. So when I say my way is The Way of the White Clouds, it is just a symbol. The white cloud is not being used as a fact; it is used as a symbol, as a poetic symbol; as an indication of a deep merger into the mysterious and the miraculous.